Leslie Mackie opened Macrina Bakery & Café in Seattle in 1993 after working with Lydia Shire & Susan Regis in Boston and as head baker at Seattle's Grand Central Bakery. She was among the first wave of Americans experimenting with recipes from European master bakers and a long, slow fermentation process. Mackie rediscovered the craft's traditional, almost spiritual importance. "In France, bakers are revered because bread is such a central part of the family and the community," she explains. This new book has more of Mackie's irresistible, artisanal breads, including flatbreads and an emphasis on traditional Italian breads. The reader will also find cakes, cookies, pies, and other sweets and savories that devoted customers love. Mackie is deeply rooted in the Puget Sound community and treasures the relationships she has with customers, employees, and producers. Stories of some of her favorite people are sprinkled throughout the book. Leslie Mackie picked up her kitchen skills at the California Culinary Academy in San Francisco, and she honed her craft working with acclaimed chefs Lydia Shire and Jasper White in Boston. She caught the bread fever while working in Los Angeles in 1987, when artisan bread was just emerging from wood-burning ovens in popular restaurants. In 1993 she opened Macrina Bakery & Cafe, which has been written up in Sunset and Pacific magazines, Bon Appetit, The LA Times, The New York Times, The Seattle Times, Seattle Weekly, and Seattle magazine. Leslie's recipes reach beyond Seattle, from her appearances on Julia Child's Baking with Julia television series to an Outstanding Contributor Award from the James Beard Foundation. Leslie has also received nominations for the Outstanding Pastry Chef Award from the James Beard Foundation. "Macrina's book has a slightly more European feel—just like the SoDo bakery on a rainy weekend—with many recipes based on their brioche dough. There are striking variations on yeast breads—herb baguette, pretzel knots, schiacciata, and a lovely no-knead loaf, and more elaborate cakes with layers of lemon curd and raspberry filling." 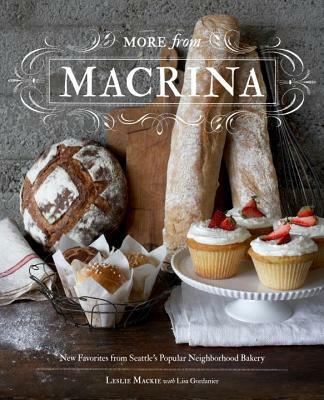 "More than a follow-up to the original Macrina cookbook, this inspiring hardcover features recipes for the artisan loaves, rich brioches, and enticing pastries that have been added to the bakery shelves in the years since the first cookbook was published, as well as profiles of the people, providers, and philosophies that make Macrina so beloved in Seattle. There are also savories like breakfast hash and BLTs." "Established in 1993, Macrina has legions of Seattle fans. The founder’s newest cookbook reflects the bakery’s blend of baked goods and savory foods, with recipes such as flatbreads, traditional Italian breads, herb baguettes and tempting sweets, including cookies, muffins and coffee cakes." "The irresistible aromas of fresh-baked bread, tarts and pies might soon waft through more Island kitchens than usual — now that one of Seattle’s celebrated pastry chefs has issued her second cookbook." "It seemed high time for a sequel, and I think it’s a great one. The book covers not just simple cookies and cakes, but many of the artisanal breads that Macrina is famous for, like their baguettes, pugliese, and flatbread. I also like that there are chapters dedicated to some cafe dishes Macrina serves, such as their BLT or their savory bread pudding... I like that many of the chapters feature a master recipe (like brioche) and then have several recipes showing how to use the dough – I love baking books that show how different pastries are related. The design is quite elegant and clean – Sasquatch did a beautiful job with this book."